Pumpkin cookie pie answers the question, Should you make pumpkin cookies or pumpkin pie? Why not BOTH? In ONE pie recipe?? An easy pie crust filled with pumpkin spice cookie dough! I am in love with my cookie pies, that’s for sure. Funfetti, candy, oatmeal – I’ve made so many! (And I have another one in the works!) 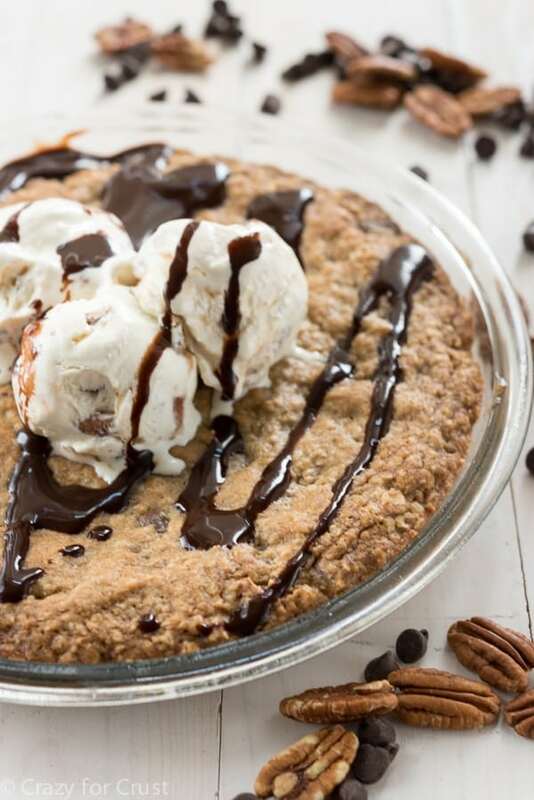 I think I love cookie pie so much because it combines two things I love – cookies and pie. Plus, they’re so easy to make. All you need to make a great cookie pie is a great cookie recipe and a pie crust. They bake up perfect every time! There’s no need to worry about the filling leaking or the cookies spreading too much – cookie pies are practically foolproof. Since it’s totally pie season and we should all be eating pies for days and weeks (that’s the law in November, right? ), why not make a cookie pie for Thanksgiving? Of course, if you’re going to to do that, it should be PUMPKIN. 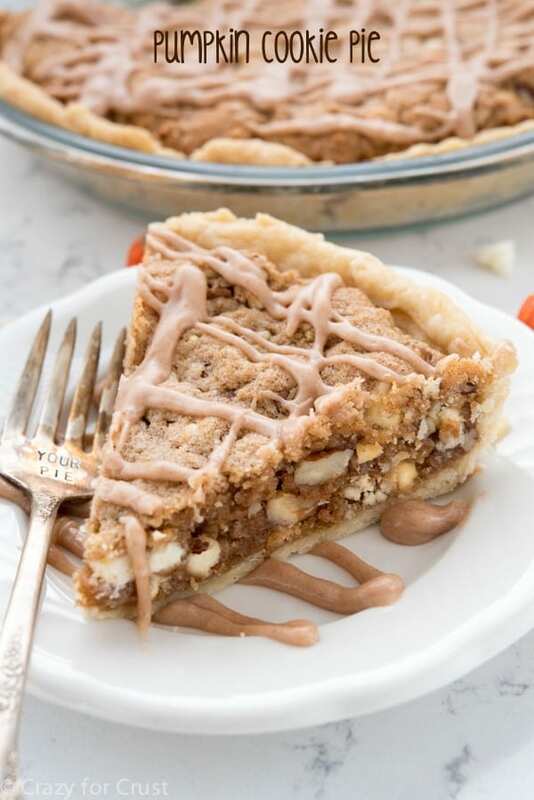 This pumpkin cookie pie is even easier than all my other cookie pies. You know why? They start with my favorite – Krusteaz mixes! First of all, I had no idea that Krusteaz even made a pie crust mix. (I’m a horrible excuse for a pie lover and ambassador, aren’t I?) In fact, their pie crust mix was their first product (just add water!) and it’s where Krusteaz got their name. Get it? Krust-eaz. Crust ease! The pie crust mix is easy to work with. You literally just add water and stir, then roll and put it in your pie plate. Then you have to fill it with the cookie part of the cookie pie! Have you seen the seasonal Krusteaz mixes? They have Pumpkin muffins, pumpkin pie bars, and this Pumpkin Spice Cookie Mix. All of them are so good, so you should grab some if you find them. The pumpkin spice cookie mix is the perfect blend of pumpkin spices and it even comes with a glaze. Simply press the cookie dough into your prepared pie crust, bake, and top with the glaze. Then serve alone or with ice cream and you’ve got the perfect Thanksgiving dessert!! Get the FULL recipe for the Pumpkin Cookie Pie here. 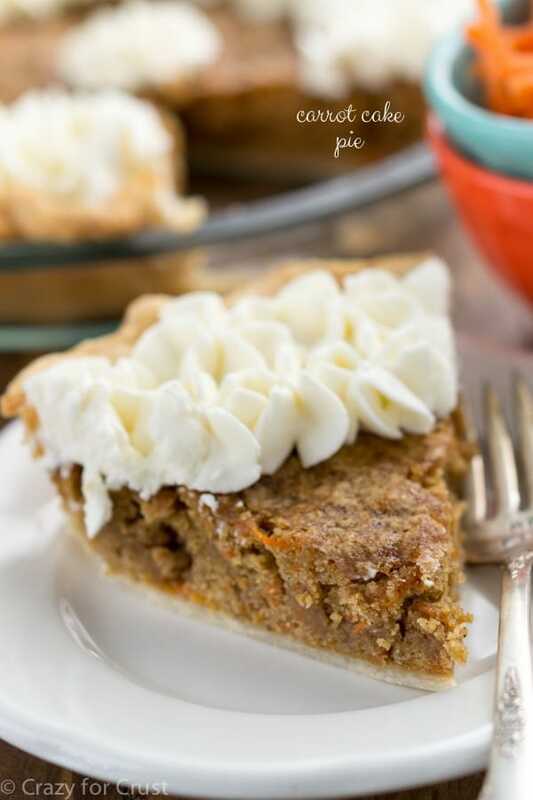 This EASY Pumpkin Cookie pie comes together in minutes with help from Krusteaz mixes. All the flavors of pumpkin cookies and pie in one recipe! Get the recipe for the Pumpkin Cookie Pie. 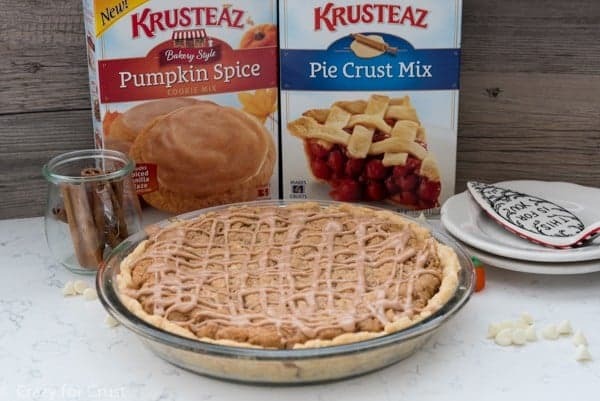 This pumpkin cookie pie post was sponsored by Krusteaz as part of my ongoing ambassadorship with them. All opinions are 100% my own. It’s two desserts in one – I love it! This looks like the easiest pie ever! And a cookie and a pie, all in one, genius! And omg Jordan has a blog!!! That is amazing!! I love cookie pies! I can’t believe how easy this looks to put together. Fabulous! I love shortcuts. This sounds so quick and easy. Nothing better than a cookie pie either! Give me a fork! Love this!! Don’t worry I had no idea Krusteaz made pie crust!!! Love Jordan’s site! Cookie Pie!?! This is amazing. This truly takes the world of pies to a whole other level! I also love the adorable “your pie” fork!! The best egg-free Christmas cookies are Snowballs. I have several recipes on the site (https://www.crazyforcrust.com/tag/snowballs/) and you can cut any of them in half easily! Decision making is one of my weaknesses. Not having to make a decision…cookie plus pie…is a joy! 😉 A few shortcuts with excellent mixes are always welcome when there are so many other foods to prepare! 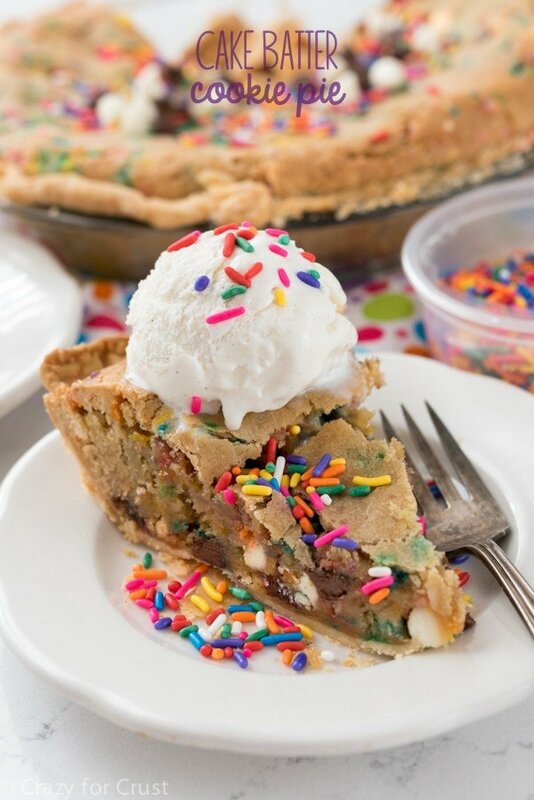 I love your cookie pies, and this one is such a winner! I’m all about ease, with crust or otherwise. I want this to be on my Thanksgiving table next week! Hybrid desserts are my favorites- no need to choose, you get it all 🙂 Pinning! Why didn’t I think of this!? Genius to make it all entirely from Krusteaz mixes!